Discussion in '9/11' started by gerrycan, Sep 3, 2013. We produced four short videos at a technical level that would be understandable by most people. If our findings are accurate, they are strong evidence that a new independent investigation is required to determine why WTC7 fell so rapidly and symmetrically. 4 videos, approx 21 minutes. If anyone wants links to the relevant drawings etc, i will do my best to put them up for you. We are a genuine research group, and are interested in opinions on this information, whether you agree with our conclusions or not. We are happy to discuss the information openly and honestly with anyone who is genuinely interested. I would also be interested in ways we could improve the information on the videos or make it easier to understand. I would suggest that you take it point by point and post the point and the evidence here. not on an You Tube, I cannot watch them because of the age of my computer. I would be interested to know if you included the conclusions of Structure Magazine in your discussions. I doubt that one element failing could cause this kind of collapse, but the point of the videos are that we found that NIST misrepresented the column 79 connection and if they had given an honest assessment of it as per the structural drawings, it would have been clear that failure in the manner they described was impossible. You did not answer my question. Did you consider the conclusions that were in Structure magazine? Are you saying that Structure magazine and their experts were misled? What is the background of your group? What is the background of the members? That is important to knowing how they interpret things. We examined the claim by NIST and others that the failure of a girder at column 79 initiated the collapse and found that their story made no sense when we compared the connection they described to the connection stated in the structural drawings. They missed out elements, they got dimensions wrong and made mistakes that at best were incompetent, and at worst, dishonest. As to our backgrounds they are wide and varied, from engineering to writing. As to the publishing of the Structure Mag article, this predates the release of the structural drawings for WTC7, and I have no doubt they if they had taken into account the contents, their conclusions would have been different. Thank you for your post Jerry, I'll make it a point to watch the videos at my earliest opportunity. ah right Jerry, my first inclination would be to suggest you use a different presenter, this persons tonal inflection is difficult for me to understand. Might just be me and my one working ear, I've been deaf in one ear since birth. But I'd suspect others might have difficulty as well. Also, show us a larger version of the prints. and maybe color code the areas in question as well as the pertinent notes. Wow a big thank you to guys for taking out the time to scientifically analyze and present your findings. And also thank you for bringing it to our attention and your humility. I found this very informative. I thought the video and audio were fine, didn't really experience the difficulty Boston mentioned above. I'm really interested in hearing what Mick thinks. Mick is very smart and well-rounded so if he can find any errors or weak points, you guys can definitely address those things to improve upon it and make for even a stronger argument. Bravo, well done Jerry. I like the simple logic thats very hard to escape. I personally never bought the single column failure but thats beside the point. You folks did a great job with your diagrams and presentation of the actual construction prints and notes. Not much arguing this one. Is there any evidence of shear studs in the debris photos? Steel workers set steel by using drift pins to temporarily hold the piece in place and then running the bolts in. They do not move on to another piece and leave there drift pins holding stuff in place till the whole building is up then go back and remove all the pins. There's an inspection at every floor level to ensure that all connections have the proper number of bolts and that all bolts are installed properly, this is a major part of the steel inspection. If it says 12 - 3/4 x 2 1/2 bolts welded, then it had better have, 12 - 3/4 x 2 1/2 bolts welded or they're not going to be erecting any more steel till the issue is resolved. Apparently these guys have obtained the prints ( bravo on a job well done by the way ) and have analyzed the required bolt patterns. I'm pretty sure that the prints are what we can call definitive from an inspection point of view. If NIST wants us to believe there were no bolts or that the connections design was altered from the prints then NIST bears the burden of proof. Print says bolts, then as a former assistant super on multiple jobs just like WTC 7, I'd put money, there were that many bolts, or someone was going to be in big trouble and that inspection failed, oh and the next floor did not proceed until the proper number of bolts was in and accounted for in a follow up inspection. Its called a big fat correction notice and you don't want to be the guy responsible for having one handed in at the trailer. Yes we did get that feedback from some, I have a very heavy accent and some had difficulty picking out exactly what i was saying. The Australian lady who narrated the 4th one was way clearer and easier to understand. The colour coding is a great idea for the diagrams and one that we will use when we hopefully produce this as a longer documentary. It's great to get this kind of constructive feedback and will improve our end result. Thanks for taking the time. Yes, they are called for in huge numbers in the drawings, and can be seen on many beams and girders in the debris. The thing that interested me is the way that NIST first spoke freely about their use, and then played it down. Even with this in mind, we decided to do the thermal analysis and treat the steel in an unrestrained way. Still couldn't get it to push far enough, even allowing for no studs at all, and only allowing the beams in question to push in the direction that favoured NISTs story. It wasn't the accent, I'm pretty used to that, its probably the tone and my only having one working ear. I have poor tonal discrimination in some sound ranges. My fault more than yours. The quality of the presentation over all was excellent, I'd also note the rigorous inspection process these buildings go through to ensure all is build to specifications. I'd also note the buildings certificate of occupancy as proof these inspections were carried out in accordance with existing codes at the time. If you wish, you might also include the procedure for which steel is erected, try interviewing one of the high rise iron-workers union foreman. You'll quickly discover there is a very set procedure for the erection process. This does not include building a house of cards, all members will be installed according to specs and all connections will be complete before the structure may proceed beyond the inspection schedule. That whole industry is all about its inspection process. You'd likely find a lot of useful information there. The union men who do this kinda ironwork are a breed of there own. A real no nonsense bunch who almost to a man, or at least the ones I know, aren't buying the NIST story. Best of luck and be sure and present your longer version when you get it to a point your willing to show it. Great stuff. Yes, exactly. The <> brackets are the stud allocations, not to be confused with the () numbers which are camber mark numbers. The stiffener plates at the girder near column 79 basically took NISTs story which was already sank, and dug another few miles out of the seabed and sank it further. This is the lift that we took from drawing 9114 and highlighted the plates on it. There are many more drawings that show them. Yes, me too. We constantly try to 'debunk' ourselves before we put anything out there, so it will be interesting to see how people react to this challenging information. We are a small research group interested in engineering and 911 generally from a technical standpoint. So you prefer to remain anonymous? Any serious analysis should be subjected to peer review - not just highlighted to a bunch of amateur debunkers. As an engineering professional I find that kind of insulting to be honest, but just for the record, NIST seem to take what we say seriously enough to release erratum statements acknowledging their errors that we brought to their attention directly. And if, in your opinion, we are amateur, you should be able to debunk what we are saying in the videos instead of engaging in childish jibes. So feel free to do so.... In fact, just to make a point, tell me what length you think plate 'PF' is in the following Bill Of Materials. What childish jibe?? I asked who you are (as a group) to which you gave an evasive reply. As an engineering professional I think that you admitting that you feel "insulted" by me saying you should subject your analysis to peer review suspect. Any engineering professional should understand the concept. I have deliberately not actually commented on the content of your videos because I currently lack the capability to analyse any serious information properly, so your "proof" is irrelevant to my point. And I was referring to this site as being amateur debunkers - so your lack of comprehension makes me think even less of you. Not able to watch the videos right now, but does this clear anything up with the shear studs? 34. 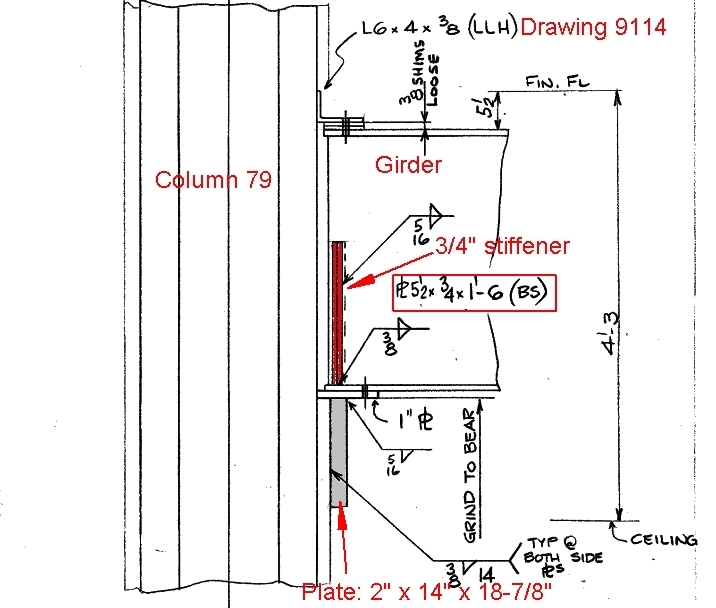 (added 6/27/12) For the WTC 7 16-story model for structural response to fire effects, why did NIST model the girders without shear studs, given that articles published in the open literature showed drawings of typical floor framing plans of WTC 7 with shear studs on the girders? Also, Mike is just asking you to explain more about why you say NIST's proposed mechanism for the collapse is impossible. Arcana like finished length vs. ordered length for a given material is perhaps a good measure of experience. But it's also trivial stuff, explainable in seconds. The question here is if you can make a clear and comprehensive case, not how much of an expert you are. This was released over 4 months after we brought the information to their attention, but I don't think you are quite getting the point of the issue, which is probably down to my lack of explanation, so I apologise for that. The issue really is that the beams had studs on them. But when the correct equations and figures for thermal expansion are applied to the connection setup at column 79, it is impossible for those beams to the east of the girder to push the girder from the seat, even when those studs on the beams are not included in the analysis. Up until that point, NIST had claimed that the required push distance was 5.5". This is exactly half of what they said the length of the seat plate was. 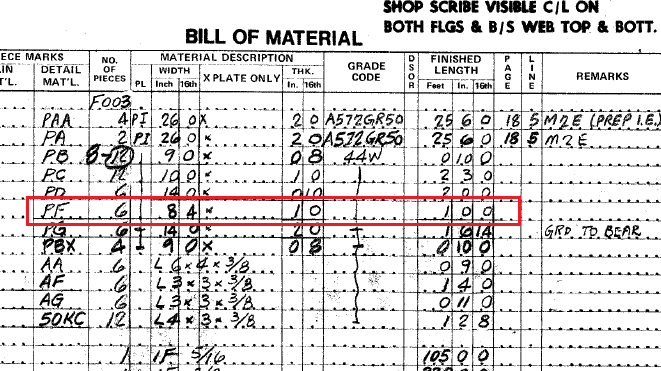 However, as you can see in the bill of materials in the above post, the plate was in fact 12 inches and not 11 as they had stated. As if by magic, NIST then released a statement saying that the amount of push that occurred was in fact 6.25", and not 5.5 as they had previously stated. They claimed that 2 figures had been substituted for each other. What they do not address is the fact that a temp of over 600 degrees would be required to do this, and as they themselves said, above that temperature steel begins to sag and loses the ability to push. I believe that NIST, being in possession of these drawings from the start, should have looked at the bill of materials and concluded that the plate was indeed 12" and not 11. However, they chose not to do that because 5.5 seemed remotely possible and made their report look more possible. These guys are meant to be among the best in their field, and I think that the American population and the rest of the engineering community deserve better. They have dug themselves deeper into a hole here, but their initial 'mistake' allowed them to present a report that looked halfway plausible as far as the thermal expansion issue is concerned. To this day, they still have not acknowledged the existence of the stiffener plates on the girder that would increase the 'walk off' required to may over 9 inches. This is just not how engineering and science is done, and NIST should not have to be dragged kicking and screaming to tell the truth about what happened to that building, even if that truth is "we don't know". Also, I do apologise to Mike if I was short in that reply to him, but we took a lot of time figuring out how to get this information expressed in such a way that is accessible to non technical people, and that isn't as easy as you might think. Please see above, and have you watched the videos? I think the case is made very clearly. Also the issue is about whether it takes an expert to know the difference between 11 inches and 1 foot. My point is that an amateur could tell the difference between 11" and 1 foot, i am sure you can. And I apologise if I was short with you. Is there a transcript or written summary of the video? Like Pete asked though, a written form would be ideal for the more technical people. Videos are useless ways to conveying information that you need to refer back to. Text and diagrams. What did you send to NIST? I am sorry, that hasn't been done. It is a good idea though, though the visuals are pretty important to this kind of issue. I will look into getting a transcript done at some point. I've just watched the first one. I'll get round to the others eventually. Can you show some photos of them in the debris, in the manner you would have expected on that beam? This was released over 4 months after we brought the information to their attention, but I don't think you are quite getting the point of the issue, which is probably down to my lack of explanation, so I apologise for that. The issue really is that the beams had studs on them. The FAQ claims that there were none indicated in floors 8 through 20, except for a sheet showing modifications to floor 10. Do you dispute that? It would be insanity not to make the floor system composite through the use of shear studs. No-one on either side of this debate now disputes that the floor beams had studs, the girder spanning column 79 and 44 is in dispute though, but the existence of studs on it is not central to this argument. I have pics of the building being constructed and some pics of debris but not online. Would a pic of the drawings calling for studs on the beams do? None on the girder, but they are on all of the beams, and that is what NIST say pushed the girder. We even left them off the beams in our analysis and they still couldn't do it. I have no comment on the technical accuracy of what you're putting forward - I am illiterate in this conversation, but I would like to say that this is the way to present an argument against the official story - no hyperbole, no ideology, no mention of Gulf of Tonkin or mind-control by mainstream media, just the brass-tacks. It's refreshing - even if you turn out to be mistaken. I suspect you have over-fixated on the single beam. The whole floor was heated, presumably from beneath, and all the beams (and column 79) were expanding, and sagging, and at half their original strength. Considering the whole floor as a plane surface, its outside was constraining and cold, and strong, and its interior was weakening, while attempting to expand and sag between its column supports. Where column 79 (and for that matter, any column) stood, there was a battle of forces. I agree with NIST that C79 was probably where the battle was fiercest. Studs cannot take much beam sagging because tremendous leverage is exerted when the beam ends are angled. They too were at half-strength at 600 deg C.
I take it you accept that once C79 wasn't laterally fixed, and at half-strength, its Euler stability was compromised. Then you have to accept that the beams also had their own Euler stability. So, even if the beam next to C79 hadn't walked off its support, what sort of instance may cause it to do so? I will suggest an answer to this: the failure of the studs by sagging beam leverage. This could have been a failure elsewhere. The floor was already unstable, being restrained by its outsides. The exterior was in tension, the interior was under compression, wanting to walk up or down. The whole was elastic, like so many springs, and the shock loads caused by the sudden release of a fixing point would have been transmitted around it. Exactly what was the trigger, no-one will ever know. Exactly how the sequence played out, no-one will ever know*. It's a dynamic and three-dimensional problem poorly addressed by both you and NIST, but much more poorly by you, because they managed a realistic simulation. * Such situations being ideal traps for the religious. You should check the supporting videos. So basically, you're claiming in your videos that the way column 79's girder was set up means that thermal expansion could not have happened to a degree necessary for displacing it. You say that this is because of structural components that NIST overlooked including platforms that added to the distance necessary for the girder to "walk" off of its platform as well as other pieces that added rigidity to the girder and that the thermal expansion calculations included an incorrect change in temperature value and failed to account for the aforementioned structural components. Furthermore, you say that the girder would not have been able to walk the distance needed to fall off of its platform under any circumstances since the temperature needed for such expansion would have caused the steel to sag before anything else. Just so that everybody who is not able to watch the videos is all on the same page with you, is this a good summary of what you are claiming?